Prepare your sauce. Combine all ingredients and whisk until well mixed; refrigerate until ready for use. Combine jalapeño, lime juice, bell pepper, lime zest, coconut milk, hot sauce, curry, old bay, salt, and shredded coconut. Gently fold in crab and taste for seasoning. Add egg yolks and panko bread crumbs and form into tablespoon sized balls. 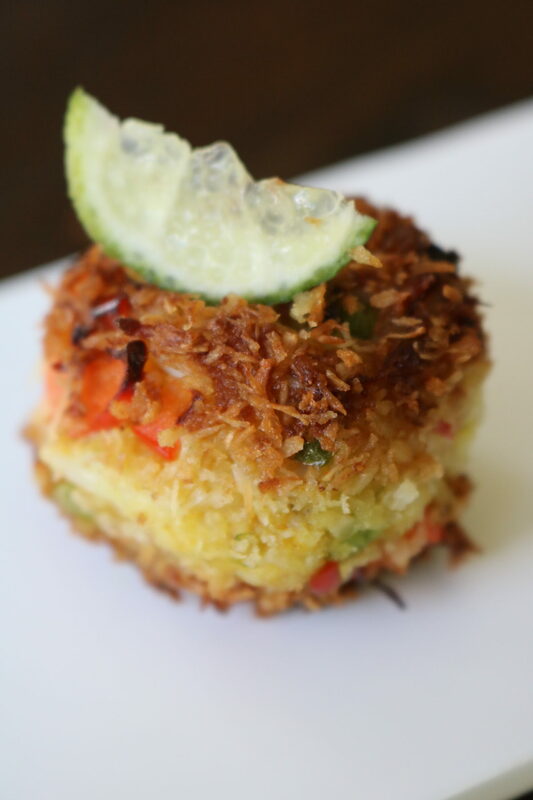 In a small bowl add equal parts panko bread crumbs and finely shredded coconut. Roll each ball in the breading and shallow fry in vegetable oil at 350 degrees for 1-2 minutes of each side or until golden brown. Remove from oil and drain excess oil on a paper towel. Garnish with a small lime wedge and coconut basil Tatar sauce. Enjoy!